As satisfying as a warm bowl of lentil soup is, I sometimes long for something different. Crisp apple and carrot cubes offer plenty of crunch in this dish that celebrates the harvest season. A splash of apple cider vinegar adds just the right tang to the goji berry-infused vinaigrette that ties the flavours of this autumn salad together. As a bonus, the honey, apple cider vinegar, and goji berries have multiple health benefits, which I was also craving due to the onset of cold and flu season. Next time I might sprinkle a bit of cayenne pepper on as well, to fight off illness and add a spicy kick. I am quite fond of lentil salads, often turning to this savoury lentil salad by Serious Eats. And now that Thanksgiving season is near and sweet potato prices are enticingly low, I plan make my citrusy Sweet Potato Salad with Lentils & Wild Rice again–this time roasting the sweet potatoes. I cannot get enough lentil salads it seems. Do you have a favourite fall salad? Bring 4 cups of salted water to a boil and add bay leaf and lentils. Simmer lentils over medium heat until tender but not mushy (al dente). Drain cooked lentils and let cool for several minutes. Meanwhile, in an electric blender, pulse olive oil, vinegar, goji berries, celery seed, and cardamom until an orange sauce forms. It is fine if some berries are still intact. Add honey to taste and blend briefly to combine. Add the goji berry vinaigrette to carrot and apple cubes. Stir in lentils until evenly mixed. Add more salt or vinegar to taste if needed. Chill until ready to serve or enjoy at room temperature. This recipe is shared at Allergy Free Wednesdays, Gluten Free Wednesdays, and here. Such a wonderful combo of savory and sweet! Looks delish. I’ll have to check out that salad. You have some of the best salad recipes around! 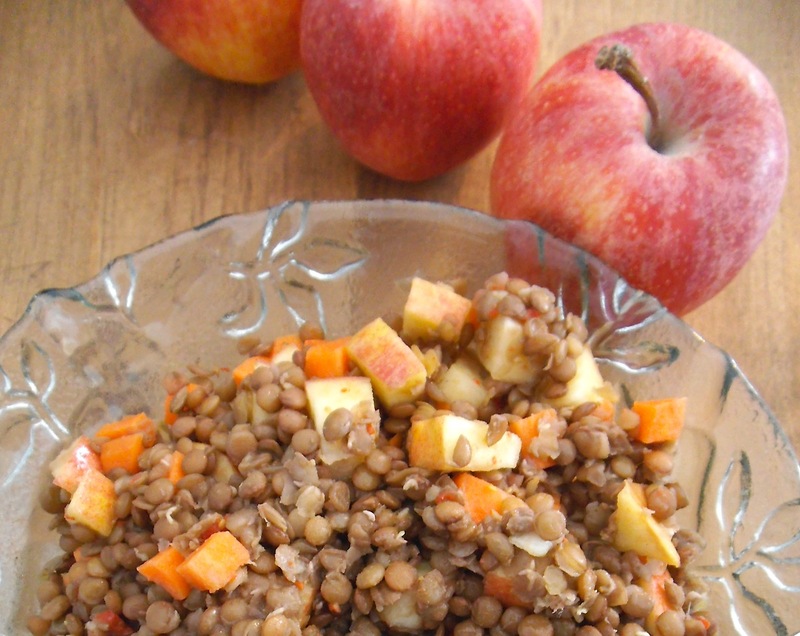 This is a fun twist to lentils! Indeed it was. I like that my lentils are locally grown too. 🙂 It’s fun to experiment. I thought so too. I’ll be making this salad again for sure. Such a bright and refreshing sounding salad!! 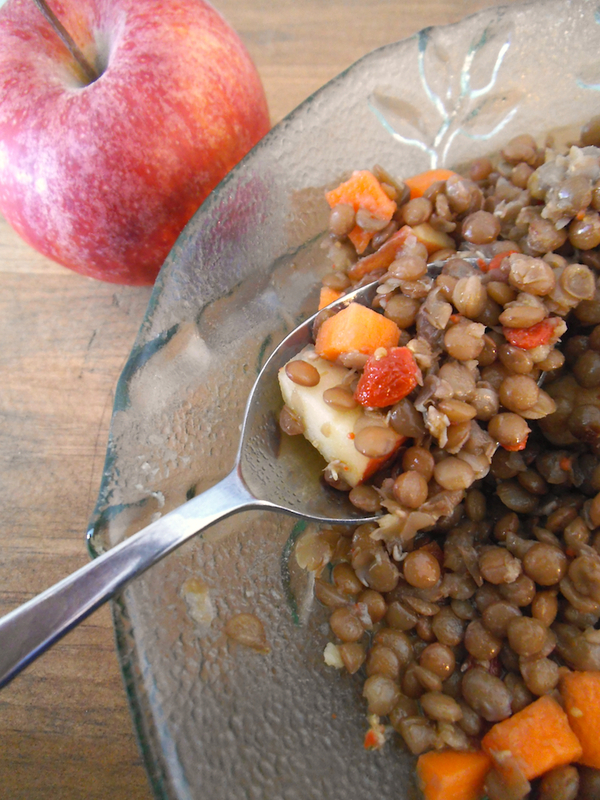 I’ve never had goji berry anything before, but the apples with lentils sound like a good combo! Thanks so much for sharing this at Savoring Saturdays! You’re welcome! Goji berries are worth trying, and a little go a long way. Most health food stores carry them.